North Dakota State players celebrate with the Dakota Marker trophy after defeating South Dakota State 21-17 on Saturday at the Fargodome. The biggest FCS Game of the Week was about a lot more than a piece of rock. 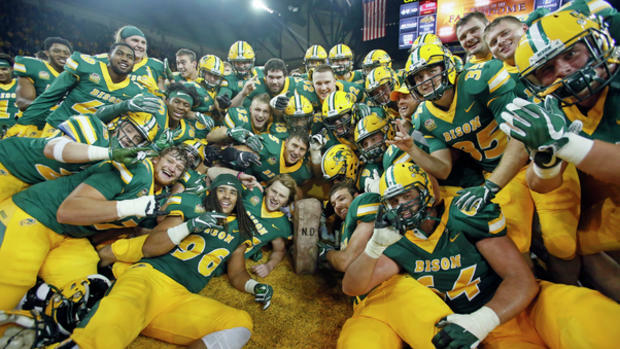 North Dakota State’s hard-fought 21-17 win over South Dakota State in the Fargodome was a marker for a heck of a week in the FCS. Aside from the Bison win, Missouri State upset the apple cart in the Missouri Valley Conference with a 24-21 win over Illinois State, Sam Houston State kept their Southland title hopes alive with a gut-check 34-31 overtime win over Central Arkansas, Stony Brook found a safety to be the difference in a 29-27 win over Villanova, and East Tennessee State, for the first time since 1996, sits atop the SoCon after their 17-14 win over Chattanooga. Click on the score for a detailed recap of each game and the video to see highlights.